"Ensure the variables defined in roles/openstack-controller/vars/main.yml and roles/openstack-compute/vars/main.yml are satisfactory." What values should I set for ? 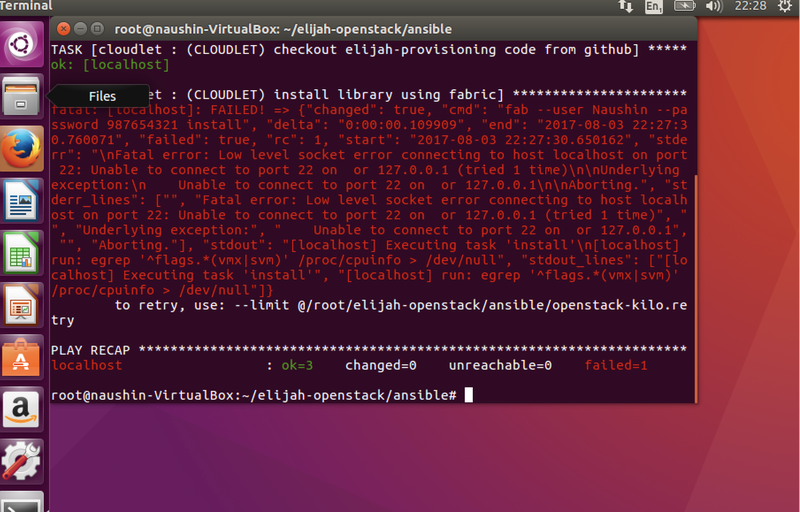 What are the other variables I should change in the openstack-controller and openstack-compute ? Install any version of emacs by using command terminal like below. main.yml file will be opened edit it and save. you have to type your ubuntu userid and password here. Thanks for reply. I got this error. Please help me. Do you have a firewall setup on this machine? Using ufw perhaps? It appears that ssh traffic (port 22) is blocked and the fabric script first ssh's to the machine then performs the commands remotely (even though in this case it is all done on your local machine). You'll need to figure out what is blocking that port. Hi Tom, Thanks. I setup everything from scratch and get this new error. Please help me to solve this. Thanks Tom. It ( egrep '^flags. *(vmx|svm)' /proc/cpuinfo) does not produce any output. 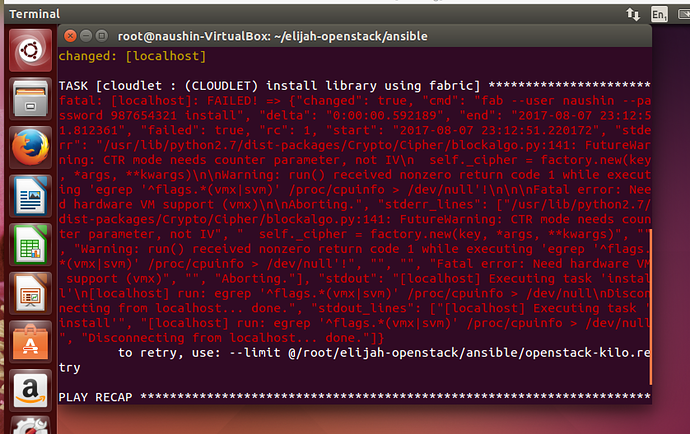 I try to enable KVM both in mac and ubuntu but got the same result. Anyway thanks for your support. It is at the hardware level that you need to enable virtualization. Often there is a flag you can toggle in the BIOS depending on the chipset you have. hello，i have the same question with you ,i want to konw how did you resolve it? Are you asking whether or not a floating IP is required initially? If so, then answer is no. This of course means you will not be able to access the VM externally until you assign a publicly addressable floating IP, but you can still get to the VM from the physical host that it is running on. If you are asking why your resume VM does not launch, that is a more difficult question to answer. Did you create a private network for the virtual machines using the nova network-create command in Step 7 of the README? If you go to the Admin->System Information menu item on the left and look at the status of the services, are any of them down? Can you check the/var/log/nova/nova-compute.log to see if there is any indication of the error?